Duck confit (French: confit de canard) is a French dish made with the leg of the duck. While it is made across France, it is seen as a speciality of Gascony. The confit is prepared in a centuries-old process of preservation that consists of salt curing a piece of meat (generally goose, duck, or pork) and then poaching it in its own fat. 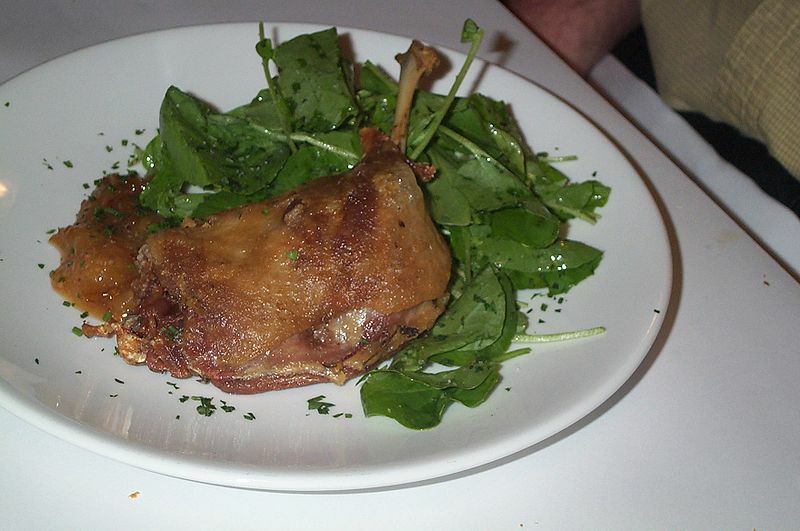 Left: Duck confit with salad. To prepare a confit, the meat is rubbed with salt and garlic, then covered and refrigerated for up to 36 hours. Salt curing the meat acts as a preservative. Prior to cooking, the salt is brushed off the meat and it is patted dry. The meat is then placed in a cooking dish deep enough to contain the meat and the rendered fat, and placed in an oven at a low temperature (170 – 275 Fahrenheit/ 76 - 135 degrees Celsius). The meat is slowly poached at least until cooked, or until meltingly tender, as little as 90 minutes or as long as 10 hours. The meat and fat are then removed from the oven and left to cool. When cool, the meat can be transferred to a canning jar or other container and completely submerged in the fat. A sealed jar of duck confit may be kept in the refrigerator for up to six months, or at several weeks if kept in a reusable plastic container. To maximize preservation if canning, the fat should top the meat by at least one inch. The cooking fat acts as both a seal and preservative and results in a very rich taste. Skipping the salt curing stage greatly reduces the shelf life of the confit. Confit is also sold in cans, which can be kept for several years. The flavorful fat from the confit may also be used in many other ways, as a frying medium for sautéed vegetables (e.g., green beans and garlic, wild or cultivated mushrooms), savory toasts, scrambled eggs or omelettes, and as an addition to shortcrust paste for tarts and quiches. A classic recipe is to fry or grill the legs in a bit of the fat till they are well-browned and crisp, and use more of the fat to roast some potatoes and garlic as an accompaniment. The potatoes roasted in duck fat to accompany the crisped-up confit is called pommes de terre à la sarladaise. Another accompaniment is red cabbage slow-braised with apples and red wine.